UPDATE ON LAUTECH POST UTME FORM 2018/2019 SESSION. 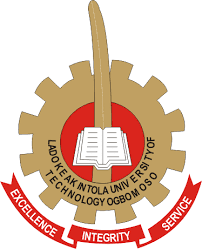 Notice is hereby given to all candidates that made Ladoke Akintola University of Technology (LAUTECH), Ogbomoso as their first choice and second choice of institution in the 2018/2019 Joint Admissions and Matriculation Board Unified Tertiary Matriculation Examination (UTME) to a Post-UTME Computer Based Test (CBT) Screening Exercise between Friday, July 27th and Saturday, 28th July, 2018 at 10:00am. For an applicant to be eligible for the exercise, he/she must have scored 160 and above in the 2018/2019 University Matriculation Examination. The application form will be available online for completion and submission from Friday, 13th to Thursday 26th July 2018. Applicants are to note that late completion/submission of application forms will not be entertained.